One of the highlights of my exchange term in Japan was introduction to lot of anime fans. At that time though Naruto was the only anime I had watched, I styled myself as a core anime fan and socialized with them getting to learn of numerous interesting anime series that were to give me hours of joy. 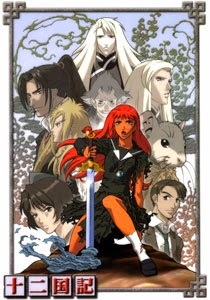 One of the first anime I heard about was ‘Twelve Kingdoms’ and to date that remains my favorite one. A fellow exchange student from Singapore told me if I had liked ‘Lord of the Rings’, I would just love this one and he did not turn out wrong. I was totally enchanted from the moment I watched the first episode and could not let go till I watched the last one. At the end, I was left longing for more. Even now the very thought of this anime brings such pleasant thoughts in my mind. The story starts in our contemporary world. The protagonist Yoko is a Miss Goody Two Shoes school girl who has the most ideal but boring life. The emergence of strange man with stranger tales of a fairy tale land totally shakes up her life. She refuses to believe him but she is forced to when she is attacked by gargoyle like demons and other monsters. The strange man rescues her and transports her along with her friends to a magical land. She comes to know that she belongs to this land and is supposed to be a queen and that the man who brought her over is actually a unicorn who can transform into a human at will. She finds this too incredible to believe and refuses to stake claim for the throne. The rest of the story is a beautiful coming of age story that tells how an insecure and immature young girl through her experiences in a strange land transforms into a sage and wise ruler. The transformation is believable and her struggle with internal and external demons through this journey is very engaging. Her problems seem so genuine and she is a character one can easily relate to. As we follow her tale, we learn more about the magical land. The land has twelve kingdoms which are islands around a central sea. There is also a magical mountain on top of which the Gods dwell. Every kingdom has a ruler who is aided by a unicorn. The ruler is immortal and continues to rule till he decides to abdicate or he starts ruling badly. If the king lets his kingdom go to ruins, the unicorn begins to sicken and may even die. The King can also be beheaded when he loses the favor of Gods through his atrocious behavior. Then responsibility falls on the unicorn to find the new king. The king and unicorn are usually bonded for life and when a new unicorn emerges as the guardian of the kingdom, he chooses the king. Along with the coming to age of the protagonist, we also have the tale of the unicorn’s emotional conflict as he was the one who had to behead his previous queen. This is blasphemous for a unicorn. He also feels she was a good woman to start with and he finds himself responsible for not guiding her properly. He often fears Yoko would end up treading along the same path. So one of the tasks for Yoko once she had dealt with her problems is to mend the broken unicorn. Moving on, we learn of the political intrigues between the different kingdoms. Initially the story focuses on the kingdom where Yoko is supposed to be the queen. But as we proceed the tale moves to the other kingdoms and we are introduced to other protagonists. The TV series mainly focuses on Yoko and there is a bit of a story about a reluctant unicorn in another of the kingdoms that is having challenges in assuming his role in another of the kingdoms. However this story is apparently based on a series of Japanese novels which have similar detailed stories from each of the twelve kingdoms. I hope to read them sometime. Other than the storyline, I found the animation and music to be amazing and magical. Overall this is a sweet take I am sure most people would enjoy. Yeah - But I have never tried any of their books. Not too sure of the language and stuff. What sounds beautiful in Japanese might be grating in Englis for all I know. But yes - the plot can always be enjoyed. That is pretty interesting storyline with an intricate world and characters, TF. The bit about unicorn caught my attention though. I have always had a fascination for oriental poetry and music. I am sure the music as sweet as you say. It is indeed, umashankar. Oriental music and art have their own unique charm. This is the one i am going to watch. I too liked Lord of the Rings, so hopefully will like this one too. Do watch and let me know what you think, Asha. You must be awesome if you are into drawing anime characters. Twelve kingdom graphics were awesome and should afford you excellent scopet to match your drawing skills against.